Did you guys have a nice weekend? I certainly could have spent my weekend more productively, but I did have a good time with friends, as well as applied to a couple more jobs. As graduation gets closer and closer, I get more and more nervous about finding a job! But really, what I want right now is for this weather to make up its mind so that spring can come and stay! Since the warmer weather is not cooperating here, I had to wear tights with this outfit. 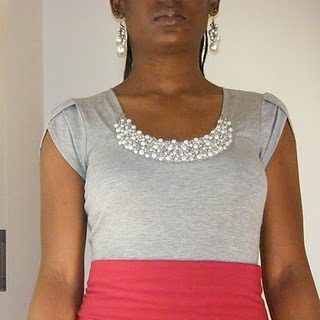 I got this t-shirt with the pearly neckline on sale at Charlotte Russe for $10 and I absolutely love it! It gives the outfit a dressy feel and matches perfectly with my earrings. Also, this skirt was a steal at Forever 21 for $6.80 and because of the waistband, I can easily fold it and wear it at different lengths. Also, I ordered some things earlier in the week and these packages should be arriving tomorrow so I am quite excited! No more shopping for a little while though as I need to earn back all the moola that I spent over spring break! Has anybody else been doing some online shopping recently? If so, what did you buy?